Whether you are a bird watcher, a hunter or anything in-between, being able to access your pair of binoculars quickly when needed is important. A binocular harness is one handy tool that can help you achieve this in a more convenient way. It will take the weight off your neck, allowing you to comfortably carry your binoculars, while making it far more accessible than when using your pack, hand or regular straps (Source). But not all harnesses are that effective and considering that there are so many different options, choosing one isn’t that easy too. Generally, a good harness needs to be comfortable to wear, be able to support different sizes of binoculars, and offer a quick and easy access to your optics whenever you need them. In light of this, we’ve picked the top 5 binocular harnesses on the market and included a brief review of each model below. 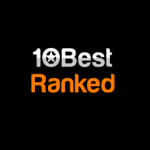 This should be a great start to help you find the best harness that will suit your particular needs and budget. 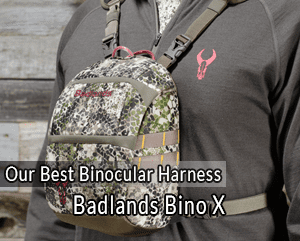 If you are looking for a strong and durable harness that will not only provide an easier way of carrying your binoculars but also offer ample protection against scratches and damages, then the Badlands Bino X is your best choice. The main feature that makes this Badlands harness standout from its competition is its great emphasis on support. The shoulder straps and chest pack are heavily padded with cushions which effectively reduce the pressure the binoculars exert on your shoulders and chest. The weight distribution both in the shoulders and back is even making the whole harness very comfortable to wear and use for prolonged hours. Another huge plus is the fact that the Bino X Case utilizes a magnetic clasps rather than a zipper system. The magnetic open and close works flawlessly and it’s very easy to operate. The best part is that it does not produce any noise. It’s very silent and you can easily operate it with one hand. The bag is strong and very spacious. In fact, this is one of the largest full-size harness you will find in the market. The pouch has enough space to accommodate even large 20×56 binoculars as well as other items. It also offers more protection to your bino compared to other normal harness. To sum it all, the Badlands Bino X is a top full-size harness that’s designed and built to the highest standard possible. The fabric used to make the straps and the whole harness is very strong and durable. Combined with its fantastic camouflage pattern, this harness is a perfect option for any avid hunter, birder or nature enthusiast. Bridging the gap between full chest pack harnesses and basic suspender type straps, the S4 Gear LockDown X is no doubt one of the best low profile binocular harness on the market. However, what really makes it stand out is the ample protection and support it offers. It does not really feature a pouch, but instead utilises flaps that do a great job of holding the binoculars in place. The flaps are comfortable to the binos and fit snugly around it keeping it safely secure to your chest. They are connected both to the shoulder straps and around the sides. Therefore, there is no bouncing or swaying while on the move like in most cheap harnesses. The two shock cords which attach the binos to the harness are heavy duty, tubular and not under tension. This is a nice change from the usual elastic harnesses as it allows you to bring the binoculars to your face for viewing without tension or tugging on the harness. Another thing to appreciate about this S4 Gear is the substantial comfort it offers while wearing it. The two straps that run around the shoulders as well as the vertical strap that holds on your backbone are both made of a non-stretching soft material that’s fairly padded. The straps and the back panel are also lined with breathable mesh. Therefore, it’s not only comfortable to wear with the binocular on board, but the breathable mesh design will help keep you refreshed and prevent sweating. The belt strap is another nice addition. It gives the binos more support and as well adds to the overall comfort of the harness. The only notable issue is that as much as the case is made up of flaps, it can only accommodate small to average-sized binoculars. If your model measures anything above 7.5”, then it won’t fit. However, if it’s small or medium-sized, then it might fit perfectly. The S4 Gear LockDown X is a well-made harness that will provide a comfortable and stable place to keep your binoculars while you are out hunting, fishing or bird watching. If you want extra protection to your binoculars, but don’t want to add more weight and bulk to the gear you already carrying, then this 12 ounce ALPS Harness is an option you would want to consider. 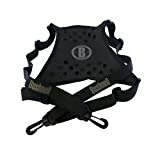 To start off, the ALPS OutdoorZ Extreme Bino Harness is a tough and sturdy low profile harness design to withstand the elements and any harsh environment. The whole harness is made of a highly-durable nylon ballistic fabric. This is a strong material, one that can survive the harsh bush environment. The straps do a good job at distributing weight around your shoulders and back too. They are not totally padded except for the small part that meets with your shoulder blades. The small paddings prevent the harness from bouncing around your back, and they offer some level of comfort around the shoulder blades. The quick release straps at the bottom of the case make putting on and taking off the harness a lot easier even with the pack on or when wearing bulky clothing. The main compartment is spacious and has a large U-shaped opening on the front. You can fit any type of binocular inside the case without hassle. Plus it allows you to easily and quickly get the binocular in and out of the case silently which is essential especially when you are out trailing your prey. The case has a fleece-lined interior with a small lens cloth attached to the front of the main compartment. It holds the binoculars in place keeping it safe and protected from damage. Another thing to appreciate is the fact that the case is located close to the chest. Thereby, you can easily access the things inside the bag at a moment’s notice. Generally, the ALPS OutdoorZ Extreme Bino is a solid and durable harness made with premium materials that will withstand the elements. 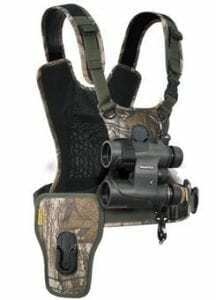 If you are looking for the perfect and most convenient low profile binocular harness for your hunting activities, then this is definitely worth the investment. No baubles or bells added. The Bushnell Deluxe is just a quality harness with a fairly basic yet stylish design. It’s a simple harness but does the job right. The material that makes up the straps and the rest of the harness is quite sturdy and high quality not like what you would find in ordinary harnesses. This one is quite tough and can withstand the weight of heavy binoculars. The straps are not padded with cushion, but the central part is. Thereby, the weight of the binoculars is somewhat spread out throughout the body making the whole harness fairly comfortable to wear. The X shaped support panel located at the back combined with the wide, elongated lower straps facilitate a snug fit and makes the harness strong enough to support even heavier binoculars or full sized DSLR cameras. The back panel is also a bit perforated hence will provide some level of ventilation to your back area to keep you cool during warmer hunts. The fact that it’s wide and nicely padded means that it will also help reduce back pains when you carry heavy binoculars for hours at a time. When you attach the binoculars, it hangs right below your chin which is just the perfect height for quick access when needed. Generally, if you are looking for a basic, no fuss harness that can help lighten the load and as well last for years, then Bushnell Deluxe is a great choice. Vortex Optics is another simple, lightweight, easy to use harness that’s quite ideal for lovers of bird watching. Its compact size and strong fabric makes it also just right for hunters who don’t mind not having that extra protection that comes with having a pouch or case. It pretty much has the design of a basic harness, but the straps are made from a good quality nylon/lyrica material. They are fairly comfortable when you put them on and are much better at distributing the binoculars weight around the body than ordinary straps. You feel little to no weight on your back when carrying heavy binoculars. The straps are strong enough to support a wide variety of binoculars sizes, even cameras if needed. It keeps the optics secure to the chest without causing any discomfort on your neck. Like the Bushnell Deluxe, this a basic harness, so it does not provide any real protection to your binoculars. 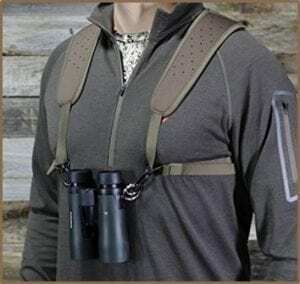 It is a nice option for bird watching, but if you are going to densely wooded areas, then you might want to consider the Badlands Bino X and ALPS OutDoorZ Extreme Bino harnesses. A basic harness employs a very simple system that consists of several straps that cross over the back and uses ties and lips for your binoculars. They are very basic but more convenient than ordinary strands. You can even find models that have large padded back panels and are also perforated to reduce sweating. However, they are not heavily padded which makes them only fairly comfortable when carrying small to medium sized binoculars. They also offer less protection to your binoculars. In short, if you like bird watching or hiking, then this might be a good fit but not for hunting in dense bushy or wood environment. The Low-Profile Harnesses have much comfortable and extensive strap system. They are somewhat similar to basic harnesses, but what sets them apart is the upgraded and more comfortable straps. They have extra padding on the back panel and shoulder straps for additional support and comfort. Furthermore, they offer some level of protection to your binocular as most of them come with either a pouch or case. These storage bags are usually spacious and can accommodate medium to large-sized binoculars. These are perfect option if you are a hunter that’s always on the move. They are lightweight and offer great comfort while not being too bulky. If you are looking for optimum comfort, protection and durability, then you should consider getting a full-size harness. These types are multi-purpose and they are the most used style of harness. They are more elaborate with heavy extra padding around the shoulder straps and back panel. They also feature full sized pouches that can accommodate almost any size of binoculars and offer ample protection. The best part about these type of harnesses is that they come with extra compartments for storage as well as some other useful accessories. However, they tend to be a little bulky and sometimes heavy. Nonetheless, if you are an avid hunter or looking for a harness that can withstand the elements and rough environments and still offer ample protection to your optics, then you should go for a full-size harness. You might want to look at Dual harnesses, if you want something that can allow you to carry your camera alongside your binoculars. These models give you the functionality and convenience of two harnesses all rolled up into a single package. They have very comfortable paddings on the shoulder straps and back panels, and feature a second set of clips which you can use to add a camera or a second pair of binoculars to your harness. They can accommodate both heavy and lightweight binoculars which makes them another ideal option if you often go camping or hunting deep in to the forest for days or weeks. When it comes to selecting the best binocular harness, your personal preference should take a major part of your decision making. You want to ensure that you pick a model that will make it quite easy and comfortable to carry and move with your binoculars. If your outdoor activities involve venturing into the woods or bushy environments, then you need to get a harness that will endure the harsh environment and offer ample protection to your binoculars. The best options here are the the Badlands Bino X and ALPS OutDoorZ Extreme Bino harnesses. Otherwise, you can go with either of the other three options. The bottom line is to make sure you invest your money in a decent harness that will suit your particular needs.